2013 Road Trip Notes, Day 1: Surprise Groundhog Festival « Midlife Crisis Crossover! Before we left home, my wife and I were lamenting how we arrive at our locations each year with a knack for missing all the local celebrations and festivities. This year we’ll be arriving in Boston the week after Independence Day (which I’m sure Boston commemorates with revolutionary pizzazz) and three weeks before the Boston Comic Con. We’ve lost count of how many special events in years past that we missed in other cities by arriving one week late or leaving a day too early. 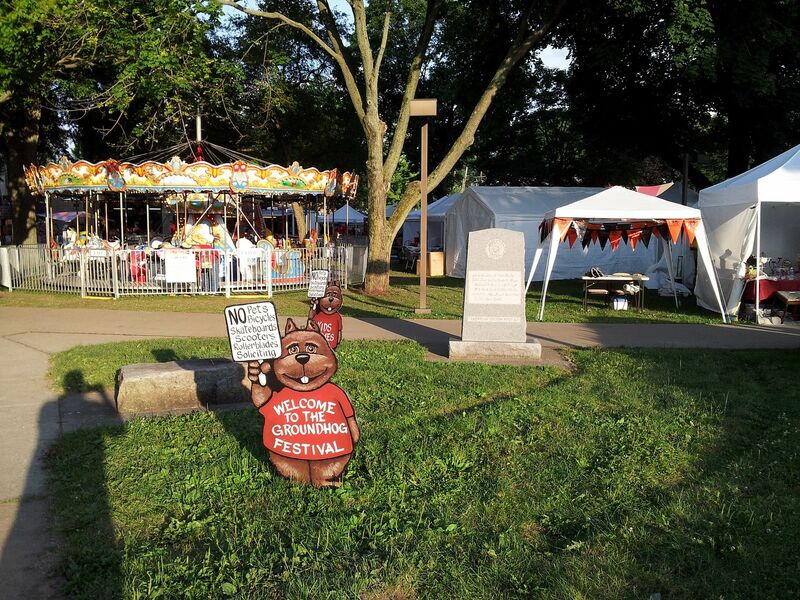 Imagine our surprise when we found a full-blown town carnival awaiting us when we arrived in the tiny, famous town of Punxsutawney, Pennsylvania, home of the latest bearer of the title Punxsutawney Phil, the world’s most renowned and wildly inaccurate weather prognosticator. Fans of the movie Groundhog Day have glimpsed moments of a simulation of Phil’s annual routine. I was under the impression that Punxsutawneyers (Punxsutawnians? Punxsutawnerites? Punxsutawnists?) had one truly busy day on their calendar followed by 364 days to relax, enjoy their tourism wealth, and prepare for the next year’s party. Surprise! We wandered into town during their annual Groundhog Festival — a street fair with carnival rides, art/craft booths, and outdoor stage for live music, which upon our visit consisted of a guy covering Rod Stewart covering Bob Dylan’s “Forever Young”. It is also possible at some point that a duly designated town official might have mentioned something at the microphone about groundhogs. If so, we missed that part of the ceremony. We didn’t stay long. To be honest, we felt like intruders in someone else’s super-sized garden party. Our modest expectation for this detour was to view the Phil in his public terrarium, see a groundhog statue or five, consider our time well spent, and depart quietly. Mission accomplished this time, plus small-town Groundhog Gala bonus round unlocked. Is that “No Tourists” I see on that groundhog’s placard? LOL! Thankfully the policemen we saw on duty weren’t the kind to spot strangers and run them out of town before we could stumble across any deep, dark town secrets. Good thing we didn’t all bring skateboards or we’d’ve been in a mess o’ trouble.